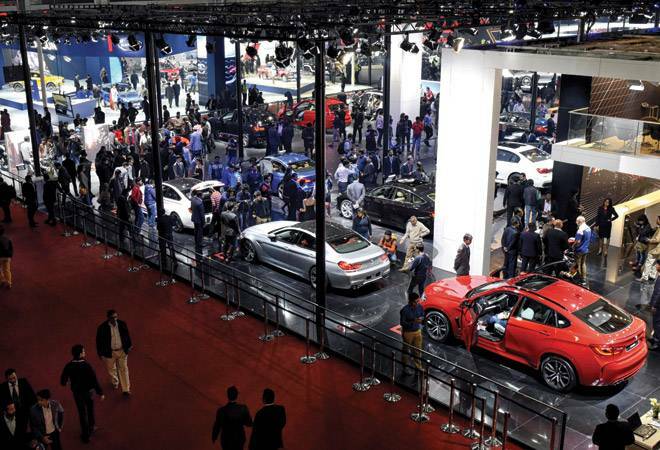 A depleted Auto Expo shows inequitable growth in India's automobile industry. Beyond the fancy neon lights and the usual razzmatazz, the 14th Delhi Auto Expo, being held in Greater Noida on the outskirts of New Delhi, is exposing the soft underbelly of the domestic automobile industry. While there are always a few companies which skip the event every other year, the list of absentees from this years seven-day event starting February 8 is long. The two-dozen absentees include two-wheeler makers such as Bajaj Auto, Royal Enfield, Harley Davidson and Triumph to mass market car companies Ford, Nissan, Volkswagen, Datsun and Skoda to luxury heavyweights Audi, Volvo, Jeep and Jaguar Land Rover. The reasons for the no-show vary from lack of exciting products and disillusionment with the concept of the show to high cost that ensures a poor return on investment. A typical 4,000 square metre stall costs upwards of Rs 3 crore for seven days. Add the cost of creating experience zones and management and logistics costs and in some cases the price of hiring celebrity brand ambassadors too and the money spent can escalate to almost five times the rental. Some of these costs can be controlled but in an event where the stature of a company is judged by the size and glamour quotient of its stall, that is easier said than done. "Multinational companies have to maintain their brand identity and standards and cannot cut costs when they are participating in an event," says Arvind Saxena, who has worked in Maruti Suzuki, Hyundai, Volkswagen and General Motors in senior positions. "This puts pressure on their finances. But more importantly, it makes sense for companies to participate only when they have something absolutely new and interesting to showcase." With footfalls of over 6,00,000, the expo is one of the biggest spectacles in the world, but to some the investment is too big and the return too small. Even market leader Maruti Suzuki had skipped the event back in 2002 citing high costs. It, however, returned to the fold in the subsequent editions. "It is a question of return on investment," says Rohit Suri, President and Managing Director, Jaguar Land Rover India. "We have very niche products and are already established in the market. In previous years, we were new and wanted to increase awareness about the brands and so the expo made sense. Now, we are focusing more on our own experience events where we directly target customers. That also costs a lot. So, it is a question of priority. In Auto Expo, what we get is an absolute mass of people." Further, domestic companies have been hit by a spate of disruptions in the economy since the last expo in 2016. Beginning with the ban on registration of big diesel cars to curb pollution in early 2016, demonetisation in November 2016 that resulted in a temporary slowdown, the abrupt switchover from BS III to BS IV emission norms in March 2017 and then the fast-paced changes in taxation under GST, automobile companies have been facing challenges on multiple fronts over the last few quarters. Further, the expedited timeline for moving to BS VI emission norms in 2020 will entail large investments by manufacturers towards upgrading their vehicles. Clearly, the pressures of managing a volatile market and tricky regulatory framework have taken a toll. "The expo is a great place to be and everybody needs to participate. However, this year, we lost money during the transition to GST and BS-IV regimes, and are being a bit cautious about investing," says Vimal Sumbly, Managing Director at superbike maker Triumph India. Yet, the biggest problem that is seldom spoken about is the inequitable growth in the industry and the poor financial health of most companies. 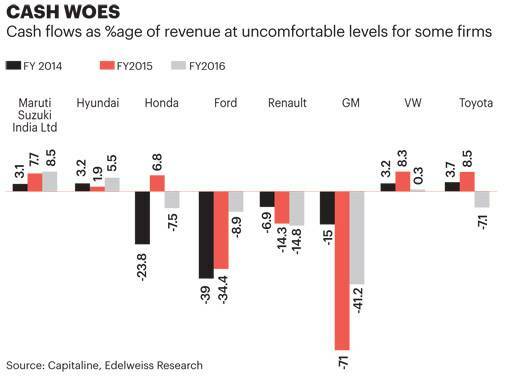 In the passenger vehicle segment, the top three companies, Maruti Suzuki, Hyundai Motor and Mahindra and Mahindra, command nearly 75 per cent market share; the other 18 companies have to make do with the remaining 25 per cent. Maruti Suzuki's 50 per cent-plus share is a huge anomaly. In most other markets, leaders have far lower shares - 17 per cent for VW in China, 17.6 per cent for GM in US, 28 per cent for Toyota in Japan, 21.4 per cent for VW in Germany, and 12 per cent for Ford in the UK. In commercial vehicles and two-wheelers, the top two players account for 70 per cent and 65 per cent market shares, respectively. This makes it extremely difficult for newer players to gain traction. "India is not an easy market for new players. It is heavily skewed in favour of market leaders. 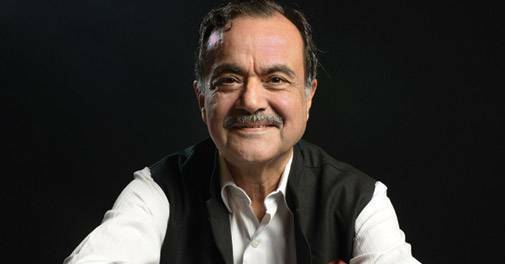 The top three players command among themselves 75 per cent market, leaving crumbs for the rest," says Jagdish Khattar, Founder, Carnation Auto and former managing director at Maruti Suzuki India Ltd. "At least for the next few years, these top players are also the ones that will continue to grow faster than the market. So, it is easy to understand the pessimism." 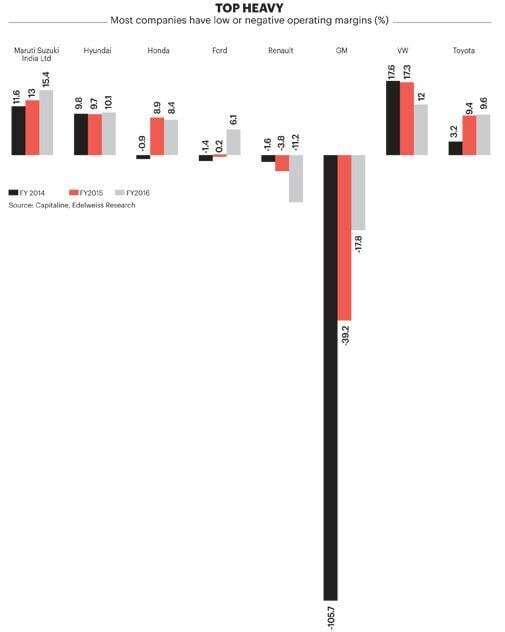 Even as a sector, automobile is not the most profitable. According to data compiled by the Centre for Monitoring Indian Economy, the net margins for two-wheelers, passenger vehicles and commercial vehicles in India in 2015/16 were 8.5 per cent, 3.43 per cent and 0.26 per cent, respectively. In a list of 150 sectors, they stood at 24th, 69th and 108th positions, respectively. In a scenario where the competitive intensity has been high, the balance sheet of the fringe players does not make for happy reading. "There is a misconception that this industry is very profitable. There are a few players that are profitable but most are not," says Sugato Sen, Deputy Director General at the Society of Indian Automobile Manufacturers, the main organiser of the expo. "There is an unjustifiable tendency in some sections to treat this sector as a milch cow. Companies had to bear losses due to changes in emission norms and GST. Now that the date for implementing BS-VI emission norms has also been advanced, there is a lot of investment that is required in the near future. So, it is not a surprise that the companies are keeping a watch on their expenses." Last year, General Motors grabbed headlines when it announced its decision to exit the domestic market after staying here for over two decades. All it had to show for the effort was accumulated losses of over `3,000 crore and market share of under 1 per cent. It, though, never skipped the auto expo all the while it was in India. Others like Ford, Volkswagen and Renault Nissan have also found the going tough. Compared with market leaders, these companies operate on inconsistent and wafer thin operating margins. In a market where winner takes all, those who lead are companies that are largely self-sufficient as others struggle to get funding from parent firms. "In case of most fringe players, given the cash burn, funding support from parents has slackened over the years," Chirag Shah, auto analyst at Edelweiss Securities said in a report, Race of the Unequals. "This indicates a change in tack as they are focusing on creating a brand and positioning and cost of manufacturing rather than muscle power to create a presence in India." But the winners are not complaining. 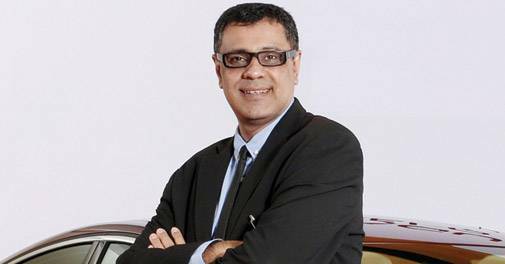 "The Indian market is challenging but offers a lot of promise to companies that are eager to grow," says Rakesh Srivastava, Vice President, National Sales, Hyundai Motor India. "One needs to understand the consumer and adapt and localise products. This is not a market where a global bestseller will necessarily work or where operations can be run by people coming from outside. You need to have confidence in your local management and suppliers. I don't think many companies have done that." Another trick in the book that many have missed is a viable export strategy. Companies that have successfully made India a low-cost manufacturing hub for their global products have generally fared better, at least financially. Exports bring in better margins, improve the quality of manufacturing and provide higher economies of scale. Even with a relatively minuscule footprint in India, Nissan is profitable, while its partner Renault is not, as it exports far greater number of cars from its Chennai factory. "Some manufacturers are exporting far more than what they are selling in the domestic market. It may seem like a strategy but another way to look at it is that they don't have a choice as their cars do not do well in India," says Khattar. If the glamour quotient seems missing at the expo this year, it may not be just a one off. The world's fourth-largest automobile market isn't a happy hunting ground for everybody.